Like many business' we have evolved out of a love affair for beauty and power. We began this journey in 1970 in the town of Tomʼs River, New Jersey. I had just ﬁnished my tour of duty in the Armed Forces (Attack Squadron Naval Air) and was eager to return to my ﬁrst love … "Cars", and so begins what will prove to be a life long endeavor in pursuit of happiness. (Beauty and Speed). 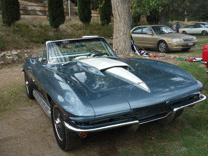 The evolution began with "Performance East Corvettes" established in 1970. We specialized in performance, restorations, and maintenance of '60's and '70's specialty cars of all makes, and in my spare time I was drag racing with my ʻ69 L88 Corvette. In 1978, Jim De Frank, a racing buddy and car aﬁcionado, called me from California about a business for sale that he thought I might be interested in, “Beverly Hills Motor Parts” (a Napa store selling automotive paint and supplies). I bought it, had it for 2 years, but still longed for the sounds of a great engine coming to life. I dreamed of gear ratios, carburetors and other fancy things. There is nothing quite like watching a dream come true. Itʼs pretty wonderful to watch your customer's face when they come in to pick up their cars. You never get tired of that feeling. "Corvette Connection" sprung to life in 1981 in Van Nuys, Ca. As the business grew we began taking on other projects: Chevelles, Camaros, GTOs, Firebirds, Mustangs, Cobras, Cudas, and Challengers to name a few. It was once again time to broaden our horizons, and "California Muscle Cars" was born. We operated in Van Nuys, California on Oxnard Street where we thrived for 30 years. We recently moved our operation to Acton, California, a pleasant 30 miles north east of Van Nuys, California. Ahh..all cars love clean Air!